UT1 Geegan and CE2 Garner are installing exterior security lights at Trench Town High School to support the promise of the school's motto "Peace Begins Here". The Seabees are from Naval Construction Battalion (NMCB) 28. 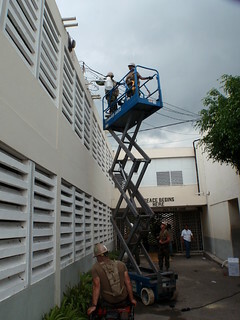 All of the security lighting on the exterior of the school is being replaced and rewired with new fixtures. The old fixtures were previously improprely installed or vandalized. The project is part of Operation Continuing Promise 2011. The Seabees are embarked on the USNS Comfort.